Sometimes you need a quick project to get back into the swing of things. I'm waiting for some Fray Check in the mail for my Loominous quilt (it's gorgeous but piecing it makes it fray like CRAZY!). This unexpected standstill had me frustrated for a couple of days, but my husband Mike inspired me to sew up some new coasters. 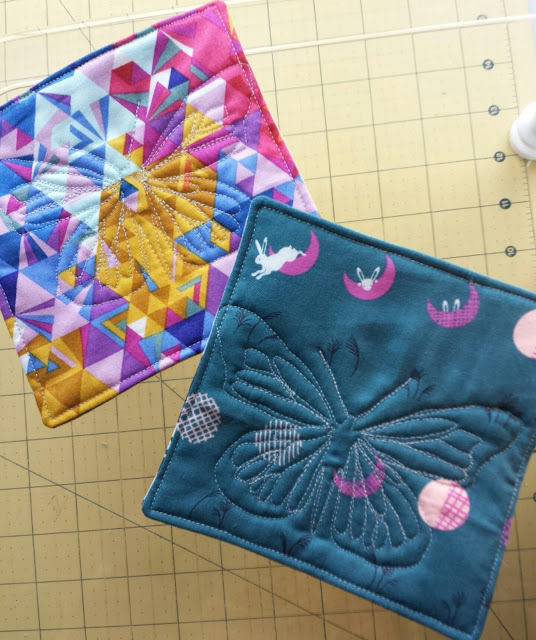 I had received some lovely coasters made of quilting cotton in the mail about three years ago in a swap. We used them every day, so they got pretty ratty. This is another reason why I don't make clothes out of quilting cotton because I worry that under heavy use, they won't last (hence my current obsession with buying knits, chambray, and voile). I'm sure that we could have washed the coasters and that would have helped, but at this point, I wanted to make my own. So when we moved, I threw the other ones away. They had a good run! All the coasters are double-sided. I cut 6" inch squares of some of my current favorite prints (the butterflies were fussy cut), and used a scrap of batting in the middle. After making a quilt sandwich (batting, then both prints right sides together), I sewed around the whole thing, clipped the corners, and turned it inside out. I added a little quilting to them with Aurifil #2600 (because Dove light gray makes them glow), and then top stitched to close the opening. I am so excited to use them! 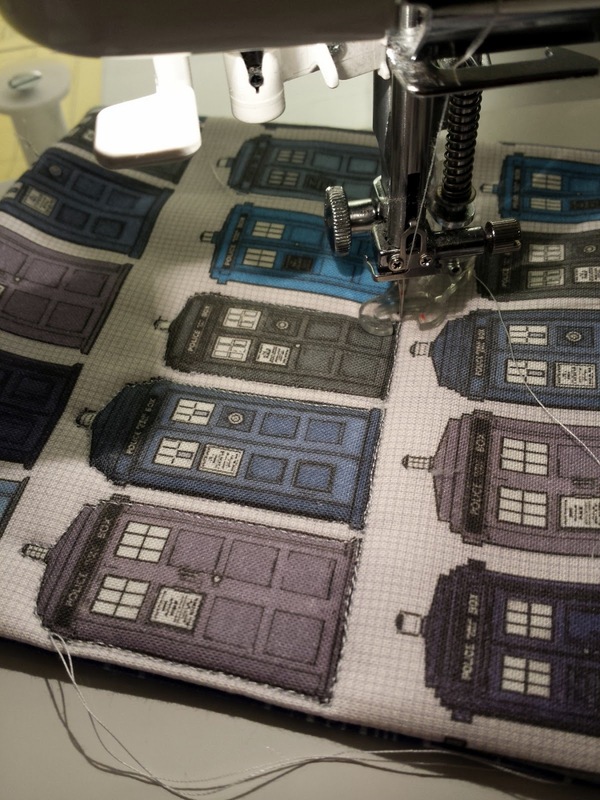 Mike requested that I use some of the TARDIS fabric left over from his Doctor Who quilt ("Allons-y, Allonso"). I bought the fabrics on Spoonflower in 2013, and it's been a worthy investment; we use that quilt every day. 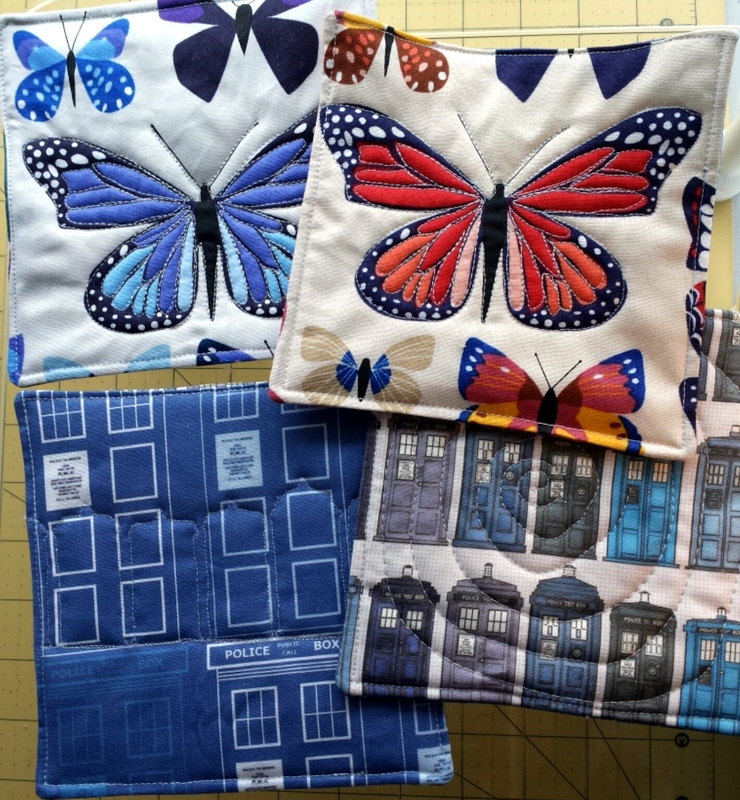 :) By the way, I can't find the two prints pictured on Spoonflower - they may be gone. 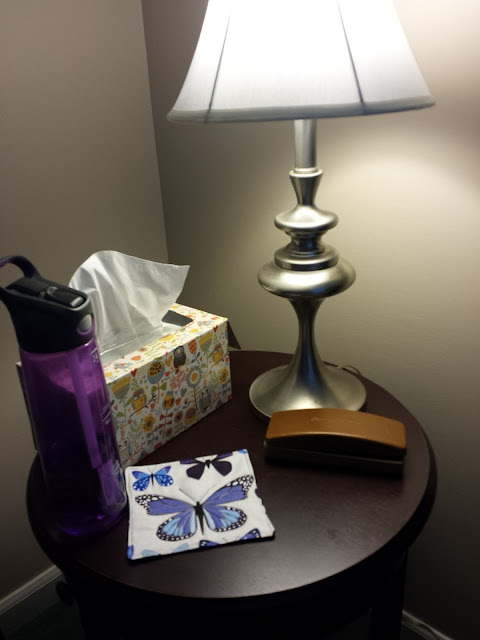 Yay to easy, quick, satisying, and useable projects. Now I'm ready to work on some WIPs. Hope you are sewing this weekend, too! P.S. Thank you so much to all of the sweet replies and messages about the first issue of The Wonky Press. I've been overwhelmed with emails the last couple of days but I will respond soon! Thanks for understanding! Oh man I love those Lizzy butterfly ones so much! I bought some yardage of those prints (one for a skirt for Aurelia), so I will need to make some coasters...which I assume will just be stolen by the kids, but still! Such a great idea. Yay for useful, quick projects. The quilting around the butterflies is great!